I make a lot of business trips, and I am tired of returning home to see a floor covered with dust. I also am not a great fan of cleaning. So a month ago I purchased a iRobot Roomba 650 – the robot should clean my apartment while I am away. I opted for a Roomba 650 for a number of reasons. First, iRobot is the company that has been in this business for the longest, and the reviews of its products are solid. Second, I needed a robot that could be programmed to clean at a certain time, rather than having to be started manually – this ruled out the cheaper Roomba 620. Third, my flat has a mixture of floors – mostly wood floors, but some tiles and a large rug – hence the choice of a vacuum-cleaning robot rather than a mopping robot (such as a Scooba or Braava). Fourth, having never owned a robot vacuum cleaner before I was not willing to go for a super-swanky model such as the Roomba 880 that is supposed to clean even better, but costs twice as much as a 650. I purchased the Roomba 650 for €349 from Amazon DE (now €359), and a pack of extra filters and brushes (€28). The Roomba 650 has in the meantime been replaced by iRobot with the Roomba 651 that has a slightly better battery and newer firmware – but this review should be equally valid for a 651 as for a 650. One Virtual Wall ships with the Roomba, but I have had no need for that to date. I also do not own a cat or a dog, so cannot vouch for how well it copes with pet hair. The Roomba charges on its docking station, and then there are two ways to start it – either by pressing the main start button, or setting the timer. I set the Roomba to clean twice a week, at 9am on Tuesdays and Fridays, and this timer mechanism has worked reliably. When the Roomba starts – either by pressing the button or through the timer – the vacuum fan starts first, then the motors for the wheels. This is the most annoying aspect of the Roomba’s operation – it is not a quiet device, and this is more due to the wheels than the vacuum part. It sounds rather like a remote control car you might have owned as a child – not as loud as a regular vacuum cleaner, but a bit grating and annoying nevertheless. The Roomba then potters off to clean the flat. My flat is about 45m2 (480 square feet), and it takes anything between 30 minutes and 90 minutes before the Roomba is done, and returns to its station. It is pretty persistent, but not perfect, at finding its way into every area it can reach. For example it can pass between the legs of my dining room chairs, but does not always correctly find the gaps, and hence sometimes misses cleaning under the table. Making sure the chairs are to one side hence solves this. This then leads me to the second issue – making sure your flat is Roomba-compatible. I have no high thresholds between rooms, and no steps anywhere in the flat, but I do have three things that caused the Roomba problems. First, it ensnared itself in the cord for my window blinds – now safely stowed away instead. Second, doors in my flat close themselves – I use Stoppy wedges to keep them open. But if these are positioned on the floor, the Roomba dislodges them and the doors close – so these need to be placed higher up the doors. Third – and most importantly – the Roomba does not cope very well with objects that are just above its own height. In my case this meant it could go under the edge of the sofa but would wedge itself further back, and it could go under the bed but would stick itself under the beam holding the mattress in the middle of the bed. It also lodges itself under the toilet (pictured). I can’t do anything about the toilet, but I have added small discs under the sofa legs to lift the sofa, and positioned the bedroom rug in such a way so as the Roomba cannot lodge itself under the bed beam. Then to the actual cleaning, for it is here that the Roomba really excels. It picks up all the hair, dust and grit from any surfaces around the house, and it is especially good on my bedroom rug – this rug has never been so clean, and the Roomba keeps on removing hairs from it. Further, as the Roomba goes under the bed and the sofa, these areas are now spotless too. My only slight critique is that as the Roomba is so good it sometimes fills up its bin rather quickly, meaning this needs to be emptied rather often. Perhaps once every loose hair has been removed from the rug this may be less of an issue. The Roomba is well built, and cleverly designed – it is easy to remove the brushes for example, to make sure hairs have not got caught around them. Replacing the filter is also very simple. In short, the Roomba 650 has so far proven to be an excellent purchase – it does exactly what I need it to do, and it cleans better and more systematically than I ever would. It has a few small down-sides, but once your living space is adapted for it then those are no major issue. I would not hesitate to recommend the gadget. Oh, and why is it called Edgar? That was the best suggestion from my Twitter followers as to what to call it. Thanks Andrew Campling! So how is Edgar doing after a whole year of service? The answer is: very well! All of the remarks above still hold true, with a few caveats. First, I have now more closely observed how the Roomba operates, and it is notable that it does not clean consistently on every cycle – sometimes, on some runs, it just simply does not find all the corners. Sometimes it cleans the rug over and over, sometimes it passes there just once. I do not see this as a problem, and as I run the Roomba twice a week it means every spot of my floor gets cleaned at least once a week. Second, while Roomba recommends replacing the filters every three months or so, I find it is the brushes that are the most important to replace. There are three brushes – all pictured here. 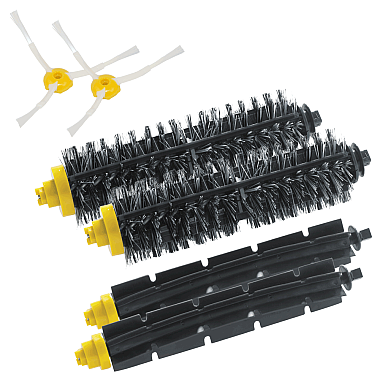 The three armed brushes help the Roomba reach into corners, while the bristled and flapped brushes do the main cleaning work. After a few months both the three armed brushes, and especially the bristled brushes, start to lose their strength – they get more floppy. This then decreases the cleaning effectiveness. Installation of new brushes does the trick – but this is worth bearing in mind when calculating the overall costs of owning a gadget like this. In the meantime the esteemed Stiftung Warentest has published a review of robot vacuum cleaners – the Roomba 650 is not among them, but the review is interesting. Anyway, to conclude: at the time it seemed like a risk to pay €349 for a vacuum cleaner. One year on I am relieved and happy – this is one of the very best gadgets I have ever purchased, and my flat has never been cleaner! Does Roomba works on hardwood floors? Love my roomba 650! I own a husky and I can tell you that it has been wonderful at picking up hair from a dog that’s consistently sheds. I don’t know why I went so long without it. 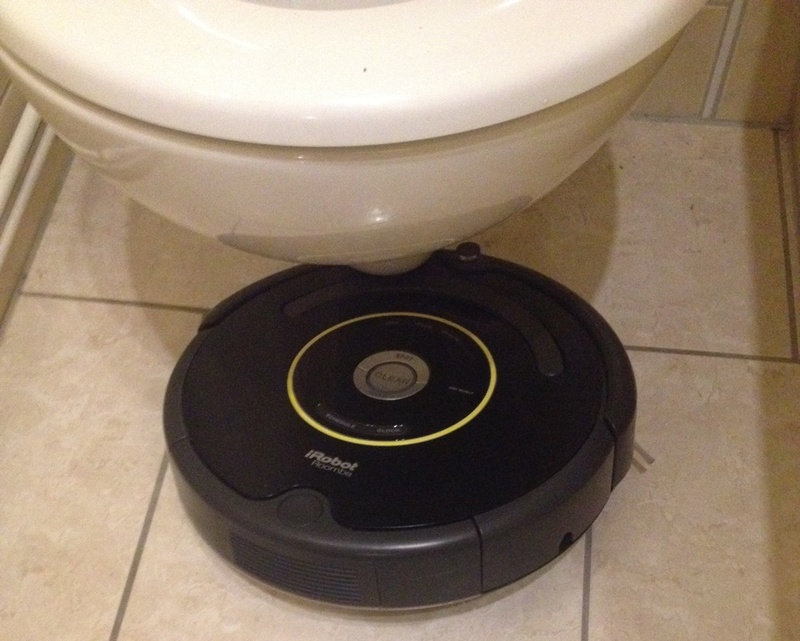 @RR – the Roomba 650 handles the 3 rooms of my flat without any problem. I cannot speak for bigger places though! @Bee Lee – that’s a downside, yes. The bin is a bit small. Needs emptying weekly really. Thanks for the review. Reading the web site from Roomba, I thought that this model can not navigate in multiple rooms. Is your house one room only, or thoes 650 navigate around different rooms itslef and return to the homebase? Thanks, it is always great to read first hand stuff! How often do you empty your roomba bins? I go off on business pretty often too sometimes weeks , if I schedule it to clean weekly would it be alright?